In the back of my fridge, behind the bottles of Boulevard Tank 7 Farmhouse Ale and cans of Good People IPA and bottles of Lipton Green Tea with Citrus and assorted bottles of water, there’s a bottle of blue pop. Sun Fresh Blue Raspberry. I bought it in February from a gas station here in Tuscaloosa, Alabama, – over on McFarland; the windows have been shuttered since the tornado-- took a few sips in the car on the way home, and stuck it in my fridge, where its stayed ever since. I’ve refused to throw it out, keeping it as a source of amusement. People will come over and I will show it to them and they’ll say “What’s that?” and I’ll say “It’s been in there since February. Wanna’ try it?” and they’ll say “no” but they’ll take a sip anyway, smell it at the very least. It’s the color of antifreeze – cobalt blue cut with undertones of sky – and still like tapwater. Flat. It was always flat, was flat from the very moment that I first unscrewed the cap. That first sip didn’t even register on my palate because the mouthfeel’s absence of a carbonation bite threw me off. But after the swallow there grew a cloying cotton candy aftertaste on the roof of my mouth. I took a second sip. Unadulterated sugar with barely a trace of fruit flavor. You might need a chaser of insulin to handle it. The sickly-sweet smell was making me kind of dizzy. After stashing the barely-consumed bottle into the fridge, I chugged a couple of glasses of water and began researching Sun Fresh beverages. I wasn’t able to find much. Sun Fresh doesn’t have a website. Did I buy something that was discontinued? Is that why it was only $0.99? I was able to ascertain through Google sleuthing that Sun Fresh is a bottling plant in Columbus, Georgia, and is a wholly-owned subsidiary of Birmingham, Alabama’s own Buffalo Rock Beverages and Food Services (makers of the superb Buffalo Rock Southern Spice Ginger Ale). Buffalo Rock’s own sparse website makes no mention of the Sun Fresh brand. I’m stashing my bottle of Sun Fresh Blue Raspberry in the back of my fridge like an easy secret, as if it were a guilty-pleasure movie tucked away at the back of the DVD shelf. I feel a connection to it, feel embarrassment but also a sort of pride. I’ve since seen Sun Fresh Blue Raspberry in other stores, along with Strawberry and Lemonade flavors under the Sun Fresh brand. They continue to exist in stores, people see them every day, but I’ve never seen anyone buy them. This confluence I see in the grocery store: embarrassment and pride both made public while the sources of the emotions remain unacknowledged. This goes for more than just Sun Fresh – it goes for the Confederate flag decals on the backs of cars in the parking lot, yes, but it also goes for the vibrant, locally-grown produce. Which is to say that something about this confluence strikes me as very Southern. Since I purchased Sun Fresh Blue Raspberry on sight, it should come without surprise that I regularly peruse store aisles for novelty soft drinks. 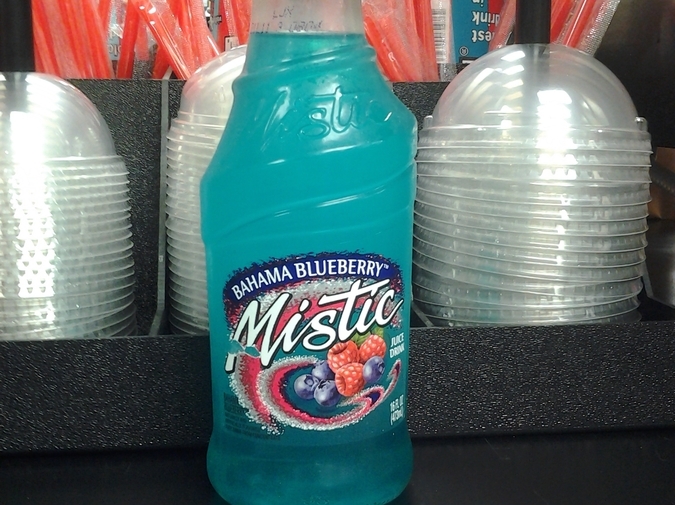 The other day I was looking at the canned and bottled tea drinks (my favorites) at a convenience store on Paul Bryant Drive when, craning my neck upwards towards a glimpse of cerulean, I read the word “Mistic.” I hadn’t seen a bottle of Mistic since roughly when Will Smith’s “Miami” was in regular rotation on MTV. Mistic -- the Mistic that I knew from my childhood anyway -- made awful “juice” drinks in bottles short, stout, and slender with gold foil covering their lids that made them look uncannily like wine coolers (which themselves were still a thing back in the mid to late 90’s). I should say here that I am not from the Deep South, that I have always identified as a Midwestern kid, that the Mistic I knew from my childhood was a Midwestern Mistic. It was purchased from Midwestern grocery stores. Until moving to Alabama a couple of years ago I had lived my entire life in the northern half of Missouri. Specifically the Kansas City area and points further north – as far away as Missouri can be from the borders of the South. Part of the problem of growing up a Missouri kid is that you’re never quite sure where being Midwestern ends and being Southern begins. Kansas City feels in every way like a Midwestern city, but its major culinary contribution is barbecue. When I first moved down South, I felt an instant connection to the food: my first meal at City Café – fried catfish, green beans, mashed potatoes & gravy, cornbread -- was basically a recreation of the average Tuesday night dinner that my mom would make. I guess what I’m saying is that I’m both connected to the South and distanced from it. That I feel perceptive about aspects of the South (erroneously, to a degree) but at the same time I can’t figure out why I can buy a bottle of Mistic here. You have to understand this; you have to understand what was going through my head when I saw that bottle: the Midwest hasn’t had Mistic on its store shelves for something like 12-15 years. This bottle was all thick glass cleverly sculpted with a swirl affect to mimic the swirling, hurricane-like mix of seafoam froth and whole fruit graphics that accentuated the faux-cursive font on the logo. Inside was a hideous shade of blue somewhere in-between Eton and turquoise. Its label read “Bahama Blueberry” but blueberries don’t even grow anywhere particularly close to the latitude that the Bahamas lie on. I immediately purchased the drink. My expectations were that Mistic Bahama Blueberry would be dreadful. I was not disappointed. It smelled vaguely like blueberry skins, to its credit, but had an overwhelming chemical aroma bordering on solvent. It smelled like the goop that old ladies get their hair set with. The taste of this “3% Juice” drink was Capri Sun all the way: a hollow, sugary, perfumey flavor. Not blueberries and not berries at all, rather some artificial fruit that exists only in flavoring laboratories. After forcing down two swigs, it dawned on me that this bottle might have long since expired. Clinton was still president the last time I’d seen a bottle of Mistic. They had disappeared from Midwestern store shelves and I’d always assumed it was a discontinued brand. I scanned the label for an expiration date but found nothing of the sort. The New York area code given was linked to Mott’s LLP, of applesauce fame. I couldn’t fathom why Mott’s would want to acquire such an obscure and panned brand as Mistic, but I figured I’d get some answers at the URL printed at the bottom of the label: www.mistic.com, appropriately enough. Only that website doesn’t exist anymore. I purchased a product whose listed website is defunct. Curious, I Googled the Mistic brand (and all of the relevant-sounding permutations: “Mistic soft drink,” “Mistic juice drink,” “Mistic Bahama Blueberry,” “Mistic AND Mott’s,” “Mystic juice drink” [sic], etc.) in an effort to dig up any information on the stuff. The vast majority of the links were to food wholesalers and distributors. There was no hard information. Mott’s own website gives no indication that the Mistic brand is under their portfolio. we believe here at mistics juice drinks that along with vault zero they r the best drinks ever!!!!!!!!!!!!! 2 supply this earth with the rad tastes of MISTICS!!!!! I took another healthy gulp of Bahama Blueberry. My stomach began to gurgle. At that point I found it plausible that Mistic’s marketing and PR were that juvenile. Believing in that esoterically punctuated info would also lend credibility to the most intriguing search result for Mistic juice drinks: a post on ValueMD.com, an internet forum for medical school applicants (specifically the post was found on the “American University of the Caribbean” subforum), that discouraged people from buying Mistic brand soft drinks because the author of the post found shards of glass in his drink. Another poster claimed to have a friend in Canada who found an entire mouse in a bottle of Mistic. I didn’t believe these stories. I passed them off as dramatic urban legends reappropriated for a new brand. It was only until I Googled the phone number printed small at the bottom of the label – 1-800-764-7842 – that I began to worry. The first four search results were snippets of a statement that reads: “Consumers with questions may contact the Company at 1 800 764-7842. At Mistic, our top priorities are to protect the health and safety of our consumers and ...” The snippets were found on a legal website, under the directories “Dangerous Products” and “Product Recalls.” Another result was a 2001 clipping from the Schenectady Daily Gazette talking about a recall of Mistic products due to ammonia contamination. My stomach gurgled again, more violently. I called the phone number at that point and was automatically directed to an answering machine belonging to the Dr. Pepper/Snapple group. Beginning to feel an awful lot like a protagonist in a corporate espionage thriller, I had the robot on the other end of the line do a product locator for Mistic Bahama Blueberry. I was told that five stores within 50 miles of Tuscaloosa carry that product: two Food Worlds and three Dollar Generals (one in Bessemer, AL). The convenience store at which I had purchased my bottle of Mistic, J.D.’s, was not listed as a supplier of the product I purchased. It all felt sketchy, like there was something to hide. And perhaps there was. The only record of Mistic drinks still being in production is found inside the tangled web of a corporate phone tree. It’s like this brand exists only reluctantly, that it’s being produced only because it’s always been produced – somewhere at least, even if not everywhere. Birmingham’s Buffalo Rock also bottles Grapico, a grape pop flush with juicy flavor and lacking the more crisp finish of a Fanta or Welch’s. I’ve seen it in cans and 12oz. bottles and 2-liter bottles in every grocery store and in every convenience store and in just about every local tienda. It seems as if everyone down South knows about it – no one bats an eye when I buy a can of Grapico from a vending machine on the campus of The University of Alabama, where I teach. That’s right, Grapico is popular enough to warrant regular spots on the vending machines at a major university -- though I had never once heard of it prior to moving to Tuscaloosa. There’s a sense that loyalty and history are important down here to the success of a consumer brand. The Grape Escape is what its marketing team has come up with recently, but it seems that Grapico sells well enough on its name and reputation alone. Grapico’s entire marketing campaign is based around this notion of tradition. Its labels proudly state “Est. 1914” and right under the name “Grapico” is an offset banner in which lies the phrase “A Southern Tradition.” Their website (which is just a single webpage on Buffalo Rock’s site) lists testimonials from presumably middle-aged and elderly Alabamians about how Grapico allows them to recapture something of their childhood. Their radio ads – yes, radio ads; talk about holding on to the past – have all kinds of old-timey sound effects and the scenarios include fishing trips, time travel to 1920’s beach clubs, and vaudevillian banter between prison wardens. Admittedly, I didn’t hear these over the airwaves. I found them on the Grapico webpage, archived seemingly just for me, for this increasingly archeological search of mine. Each radio ad is directly expressing this idea of The Grape Escape and I came to realize that Grapico is targeting Southerners who want to escape the present specifically to go back into the past. Not just childhood nostalgia, I don’t think, but something more nuanced; a belief in the expression “the good ol’ days” – the idea that simpler is always better. In the Southern past there isn’t as much holding onto traditions as there is just living them. No eulogies. Is that a fair comparison to draw? Perhaps too easy? I’m not sure how else to explain how Grapico hasn’t been replaced by Fanta. I’m not sure how else to explain that I found bottles of Mistic. How else to explain why this doesn’t happen where I grew up, at least not anywhere close to this degree. This is more than just nostalgia. It’s honest-to-goodness tradition, I want to say. It’s one of the generally accepted stereotypes of the South that it holds onto tradition. That it is reluctant, if not outright resistant, to change. This reluctance to let go of things manifests itself in outdated and harmful political thought and in perpetuating, institutionalized racism. But it is also, undeniably, the spark behind what makes the South perhaps America’s most distinctive and original region. Southern food is, for the most part, American food. When done industrially, without an eye to quality, it deserves to be mocked. But to me the products of Southern farms, the combination of French and African cooking, the delights conjured from ground and grain, from pig to peach, from black-eyed peas to bourbon, they excel because of the South’s adherence to tradition. None of this is new information, right? This is the longest, most interesting dilemma of the South to me: how to negotiate life when your proudest and most embarrassing characteristics are the same thing. You negotiate it by owning up to it, I think. That’s what it seems like the people of the South do, more or less. Ask them and they’ll tell you what problems their town or city or state has. Maybe they won’t go around drawing attention to those problems but they will own up to them. They’ll also, on the necessary flipside of this coin, work to solve those problems in their own way. They’ll continue to strive for a good life, just like anyone else from any region, and they’ll use their own unique traditions to enrich that life. The past is both the problem and the solution – a way of thinking that yields diverging paths. But (and perhaps only someone as foolishly obsessed with food as me could coax out this comparison) it seems all of these paths of Southern thought carve out a space to say to things: you’ve always been here, and maybe no one wants to see you anymore but you’ve earned a right to be here. Maybe that’s why Mistic and Sun Fresh still wind up on delivery trucks down here. These drinks have been around a long time, they’ve earned a right to stay here. We don’t know when or if we might need them again. Perhaps the lesson here is that the more a place holds onto the past, the more surprising the future becomes. I have an expectation that someday I’ll walk into a gas station in some small Alabama town off the highway and find a case of Orbitz sitting there, that packs of Mondo and Squeezit will be on the shelf at Winn-Dixie next to the Kool Aid Bursts like they always were in the ‘90s, that in the dusty corner of a Piggly Wiggly are some cylindrical glass bottles of Snapple Elements just waiting for me, that in the dimming hours of a dapper Fraternity event three men in red ties and blue sportcoats will retreat to the den not for a rare Cuban cigar but a for a can of Surge. Finding old or discontinued soft drinks for me is a way to recapture the past, to access something that has changed and gone. I desire that recapturing. It’s a play to nostalgia and it works for me. My particular escapes might not be grape but the sentiment does ring true. And I wonder if in small part that makes this Midwestern kid a Southerner. Barry Grass lives in Tuscaloosa, Alabama, where he is the current Nonfiction Editor of Black Warrior Review. Recent work appears/is forthcoming in Sonora Review, Annalemma, and McSweeney’s Internet Tendency, among others. Send leads on where to find bottles of Snapple Elements to barrygrass@gmail.com.